Color Story | Coral Loves Yellow! Happy mid-week, loves! Just popping in to share with you one of my all time favorite color palettes for Summer! I don't know about you, but I've always been a huge fan of bright and vibrant colors! And so this pretty palette of coral and yellow truly did have me at hello! I'm absolutely in love with this beautiful ruffle cake with it's beautiful blooms. Oh, and isn't that ribbon bunting just the sweetest thing you've ever seen? Looking to make a statement on your wedding day? Why not carry a bouquet of bright blooms like these? They're almost neon, aren't they? Also I can't go without mentioning her perfectly painted lips! So beautiful, if you ask me! Looking to round out your wedding day look? Why not consider incorporating some handmade accessories like these beautiful bridesmaid clutches and these sweet statement necklaces? So what do you think? Are you liking the way that these colors pop? 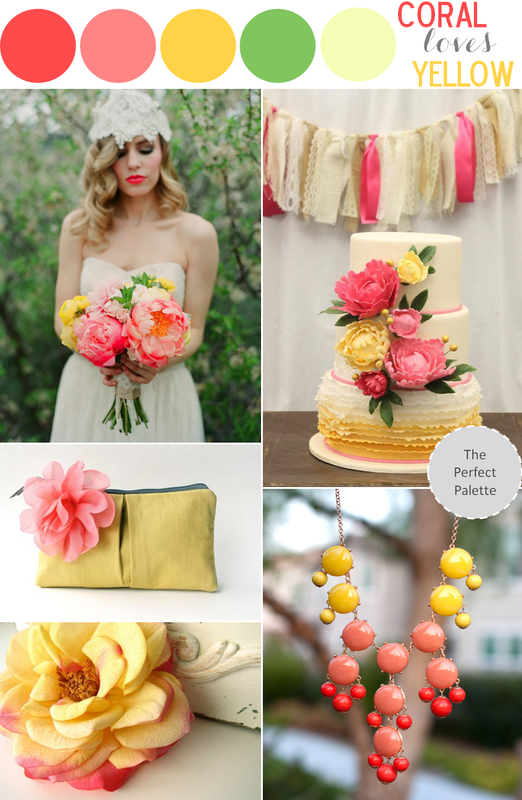 16 Comments " Color Story | Coral Loves Yellow! " Lovely, can't wait for summer days! And how was your b-day? So bright & happy, just like summer! So bright and beautiful! Swoon. Just FYI, the flower design was not designed by Laura Murray Photography ... it was designed by my company Oakes Fields Floral. Coral DOES love yellow! What an awesome combo! Gorgeous, darling! One of my all time faves. Always loved coral and yellow :) Reminds me of the wedding reception theme of a friend not too long ago, they d make for a bright, lovely color combination for weddings. Coral is very in! Love that necklace, perfect for summer days! Oh, yes! This is a palette worthy of praise! I'm in love. Seriously! And that necklace is to die for. That ruffle cake is amazing! Coral and yellow work so good together! Love the adorable necklace.